Closeout_Translucent_Vellum_Envelopes is rated 4.3 out of 5 by 3. Unfortunately we do not have 8x10&quot; in closeout translucents. We do not give samples for closeout items. Sorry for the inconvenience - please let us know if you have any additional questions! Hello, for a 6x9 what size card would you recommend would fit well into this? Hello, We do have A-10's in this envelope category that are size 6 x 9 1/2, but that may be cutting it quite close for your card. I would recommend going with the 9 x 12 size to be safe. Thanks! Yes, silver ink will work on these. can you get return address printed on envelope? Do you sell this earth brown translucent paper in sheets? Not envelopes? We do not have earth brown translucent paper available. Sorry for any inconvenience this may cause. Want to send some chills down some spines? 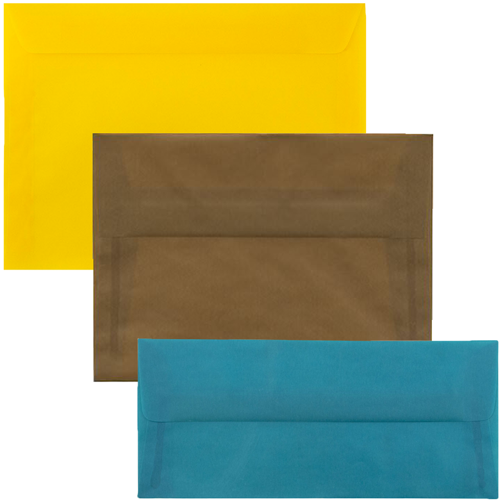 These closeout translucent envelopes don’t miss a beat! Heartbeat that is. Anyone, from an employee to a best friend, will definitely feel those goosebumps when they see that vibrant translucent envelope in the midst of all those bills. These aren’t just eye-catching because of their color though! The translucent material will keep that wonder of what’s inside but will also give them a small hint before they unseal it. It’ll be a game that will get them even more excited to open the invitation! There are so many colors and sizes available that it will definitely be hard to choose from. But the choices are all great, so don’t worry! From White Parchment to Virtual Candy Apple, you will seriously be sending all of your family and friends some chills! You don't want to miss these because supplies are limited! Closeout Translucent Vellum Envelope, sometimes called Glassline envelopes, are available in A2, A6, A6, A8, 6x9, A10, #10, 9x12, and 5.5x5.5, 6x6, 6.5x6.5, 8x8, and 8.5x8.5. Closeout Translucent Vellum Envelopes are also USPS approved.